Skyscrapers and steeples, bonfires and Bohemians, ‘zepelins’ and Zappa… Thymn Chase has plenty to elaborate on when discussing the charms of the oft-overlooked Lithuanian capital. Vilnius was founded by Grand Duke Gediminas in the 14th century supposedly after camping out in the hills above the bend in the river Neris and dreaming of an Iron Wolf (one of the better origins for a medieval city). A mere 700 years later, if Gediminas was to gaze down on his city he would see a gorgeous city wrought with character, a city which is looking to the future just as it builds on its long past. North of the river has become synonymous with the new: skyscrapers reach towards the heavens, high rise apartments are stacking up and big Baltic business is beginning to boom. In the South it’s the sight of ancient steeples jutting into the air which reminds us that this is a city rich in history and tradition. Ever since Gediminas laid the first stone, the old town, with its abundance of churches, has been the throbbing heart of the Vilnius. Not much has changed in that regard; the meandering cobbled streets bustle and buzz with students and twenty-somethings who bring this ancient city to life every day – and put it to bed every night. Besides being a big University town, Vilnius is increasingly attracting the young and upwardly mobile from all around Lithuania not to mention a steady influx of foreign investors, ex-pats and (yes, dear reader) tourists. 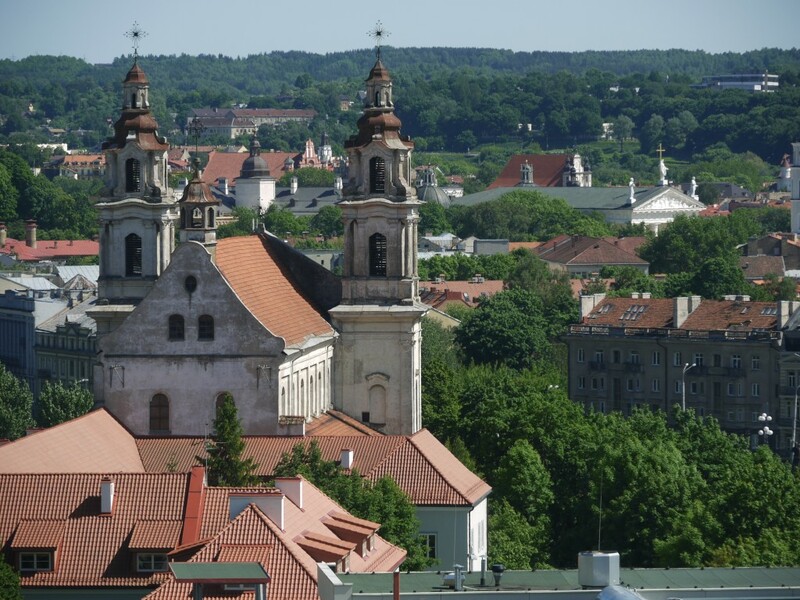 The cynosure of the city… Vilnius Cathedral. Despite being the lesser known of the three Baltic capitals (Riga and Tallinn being the others), Vilnius is by far the most welcoming, arguably the most beautiful and, befittingly, the hardest to get to. The relative difficulty of actually getting here has proven to be one of the city’s most precious qualities as it has been spared the onslaught of British stag dos and American fanny-packers that other Central and Eastern European cities have been flooded with in the last decade. Vilnius isn’t an obvious city and it won’t knock you out immediately, but its mysterious charm slowly draws you in. The capital encapsulates the carefree (and sometimes clumsy) innocence of an up-and-coming city that is growing, expanding and moving at an eccentric pace. 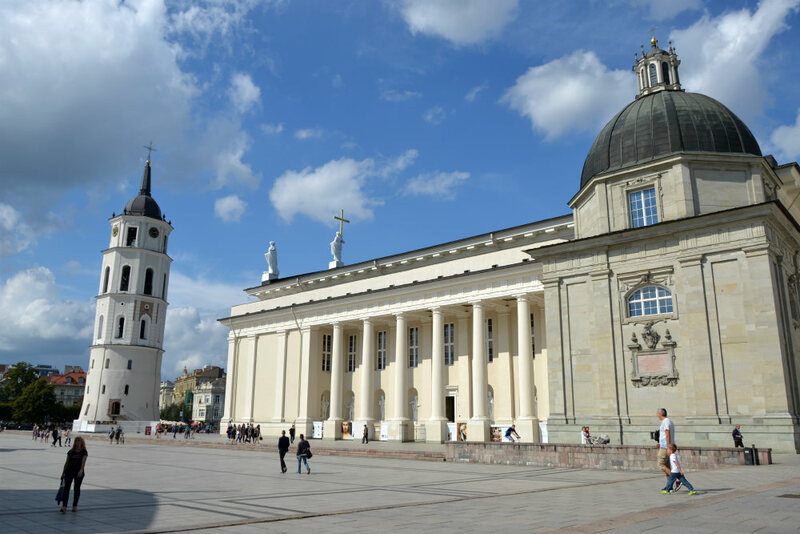 One of Vilnius’ pet names is the City of a 100 Churches and undoubtedly one of the first things you’ll notice is the austere beauty and amazing diversity of these structures of religious worship. Like other cities on the Amber belt (not an actual clothing accessory), numerous nations have planted their flag and staked their claim to this city over the last 1,000 years or so. One of many holy vistas in Vilnius. (Photo by Chad Kainz). This sometimes volatile history is best represented by the diversity of churches. The place to start is the Gates of Dawn (aka the Sharp Gate) which doubles as both the southernmost gate to the old city (5 mins from train and bus stations) and the keeper of one of the most sacred religious icons in all of Europe. The icon in question is a painting of The Holy Virgin which was immortalized by Polish/Lithuanian (not necessarily in this order) poet Adam Mickiewicz (Adomas Bernardas Mickevičius in Lithuanian). The illustrious lady alone is worth taking a peak inside the Gate’s chapel. The entire old town is jam-packed with churches. If it is in fact your bag to wander, gaze at and ponder beautiful religious monuments then you are, almost literally, in heaven… or at least on your way. Some must sees are The Church of Saint Peter and Paul (more the interior than the exterior), the Holy Spirit Russian Orthodox Church, St Anne’s and the Bernadine Church (which are both guarded by a modernist statue of old Adas himself) and finally the Main Cathedral and Belltower in the Cathedral Square. The best way to take in the whole of the Vilnius cityscape is to climb the “Hill of Three Crosses” (must have taken them ages to come up with that one). The origins of the Three Crosses monument are somewhat controversial to say the least (if you ask around you’re likely to hear several tragic accounts), but this does not belie the fact that they safeguard the best panoramic view of all of Vilnius. If you are still wondering how many churches there actually are in this town, this spot is your best bet for steeple counting. Vilnius is a small enough city that, as long as you can keep off the alus before noon, you can traverse most of the centre in a single day. One district however that you can easily overlook (but shouldn’t) is across the river Vilnelė in the East part of town. Well, district is actually an insult as Užupis is in fact its own independent Republic, complete with its own passports, currency and even a constitution (in the running for most poignant ever). The first official act of the Republic was to build a statue to revered humanitarian and chin puppet enthusiast Frank Zappa (a random but worthwhile treasure hunt). Whether you or even locals take Užupis (and the endearingly insane artists that inhabit it) seriously is entirely besides the point. The best thing to do is just go with the flow and you’ll discover a funky bohemian district packed with eclectic bars like Snekutis, a wooden shack where you can grab a local beer and a plate of pigs’ ears, and Uzupio Kavine, where you can have a coffee and as the river Vilnelė babbles by, as well as Berlinesque grafitti, surreal street art and an overall attitude that proclaims casual civil disobedience. The real irony is that since the rather radical Republic was founded in 1997, it has become increasingly popular among Vilnius’ jet-set yuppies and politicians (even the corrupt former mayor bought a place here, bless his black heart). In recent years a glut of alternative venues have added a touch of Berlin flavour to the capital, such as Peronas, occupying an abandoned platform on the train station (see our feature photo), and Keule Ruke, where pulled pork burgers are served in an old wagon whilst Putin and Trump french-kiss on the wall outside. 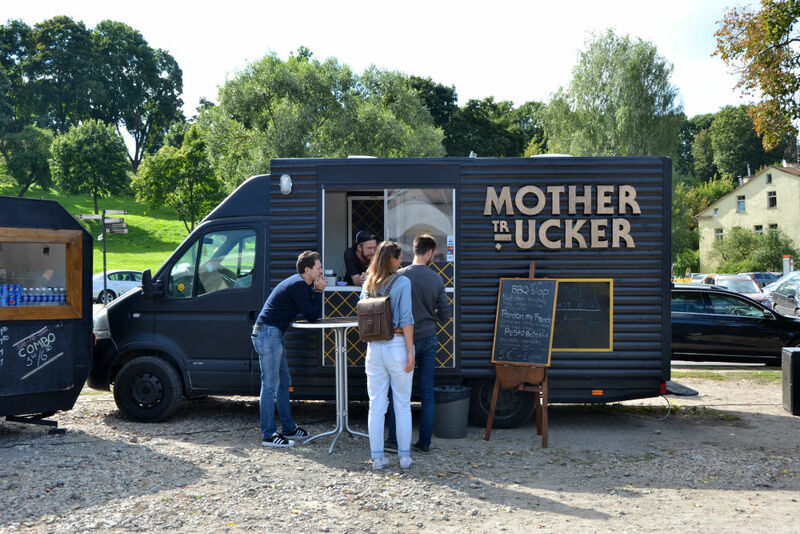 During the warmer months the Open Kitchen street food festival (borrowed from Ljubljana) welcomes customers every Friday, creating a cool summer lunch spot for hungry hipsters. Lithuania was officially the last Pagan country in Europe to be converted to Christianity, and as they say old habits die hard. There are several major festivals and countless traditions throughout the year that provide ample opportunity for one to get in touch with their inner cave man. The main event however is the Summer solstice, aka The Feast of Saint John (also known as Jonines or Rasos). 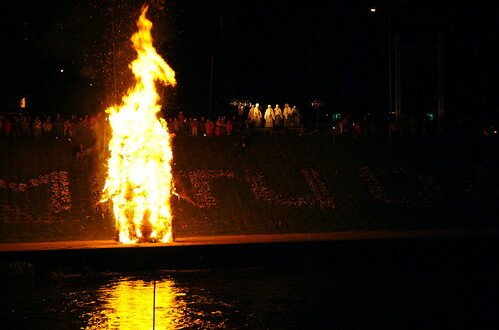 There is a lot of tossing of wreaths into the Neris River and casting of spells and generally publicly-sanctioned debauchery. If you are fortunate enough to hook up with some locals heading out of town you may get to see some fire sculptures, jump a bonfire or two, hunt a midnight fern, douse a couple virgins and wash it all off with some morning dew! Fun for the whole family. It’s worth trekking over to Trakai. (Photo by Jean-Pierre Dalbéra). 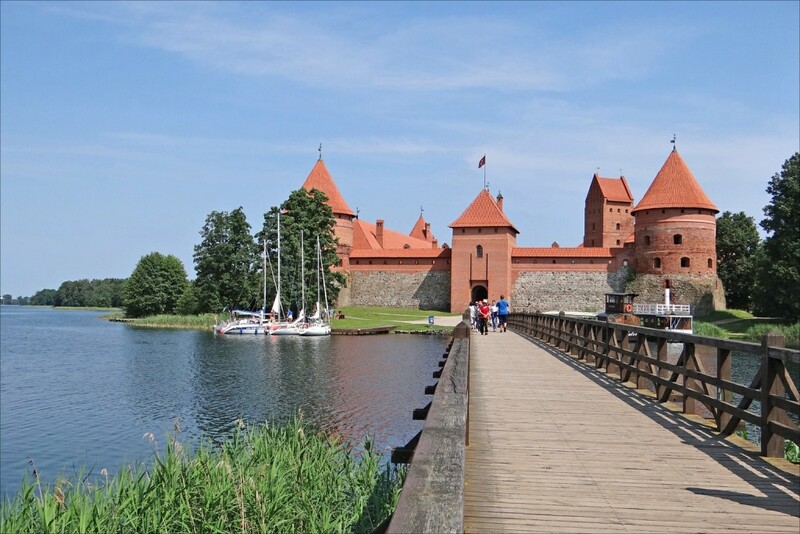 If you’re up for a great day trip to an idyllic medieval castle on a pastoral lake get thee to Trakai. Like most cities, Vilnius has a variety of options for the sleep seeker. The best backpacker hostel by FAR is HostelGate – with the finest location in town and by far the best crew of locals and travel weathered receptionists (read: vagabonds) who will not only make sure your stay is comfortable but will personally ensure you enjoy your experience (possibly holding your head over the toilet if required). For your fast-talking entrepreneur-types that can’t easily go an hour without blue-toothing your iThingy and tweetering on your FaceSpace – E-Guesthouse is your place. Don’t let the guesthouse name fool you – this is actually a hip hotel that has more amenities than a lot of 5 stars can shake a stick at. If you and your wallet prefer a more bourgeois boudoir, then take up residency at Hotel Tilto just off Cathedral Square. They call themselves a boutique Irish Hotel and they offer elegant but cozy rooms complete with antique furniture and hardwood floors, sublime services and, as you might expect, a hearty restaurant and “Guinness bar”. Much like their Polish, Belorussian and Latvian neighbors – Lithuanian food is heavy and hearty, earthy and girthy. The breadth and variety of potato dishes alone is truly staggering. We dare you to actually finish two ‘zepelins’ or cepelinai in Lithuanian (and yes these are indeed huge potato blimps stuffed with…?). And if you can get through a whole plate of vedarai (pig intestine stuffed with potato) you most likely have Lithuanian blood in your veins. You can try all of these dishes at Aline Leiciai. Lithuanian food aside, Vilnius is filled with plenty of great other culinary options. Most recently there has been a trend for cozy niche Bistro’s with small but flexible menus such as In Vino (which also doubles as the hottest wine bar in town). If you are looking for something completely different make sure you dine at the surrealistic Belgian beer house Rene. Pan Asian Briusly and Zoe’s Grill are both worth a spin as well. For a hot dog, accompanied by a DJ, in a romantic courtyard try Mano Kiemas. Me? 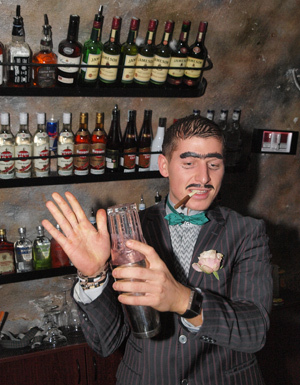 The 13th Duke of Wybourne, mixing mojitos at 5am in a bar in Vilnius… with my reputation? If you haven’t gotten the impression yet, Vilnius is a quirky city with a subtle but incessant charm. The city really starts to shine however, when the sun goes down. Alcohol is a huge part of Lithuanian culture and indeed daily/nightly life. If you are a lover of Lithuanian beer and spirits (triple nine, crazy vodkas and meads) then you are in luck/trouble. For a small city, Vilnius packs a hefty nightlife punch and you’ll be able to find whatever kind of nocturnal entertainment you may or may not be looking for. For starters, head to Cafe De Paris – which is the essential Vilnius pre-game destination. After 8pm it is usually packed to the gills with local boho types getting into it. If you prefer a funky cocktail bar head to the jam-packed Mojitos Naktys and watch Tadas perform his cocktail acrobatics (…the best mojito I’ve ever slurped). And if it’s a straight up meat market your looking for you can ply your trade while sipping watered-down overpriced drinks at Prospekto Pub. Serious clubbers are best making a beeline for Opium or Kablys… the latter even serves up a mean brunch the day after. For a fuller flavour read up on our Editor’s wild night out in Vilnius. (Not to mention his travel memories here!). It wasn’t long ago that a sum total of zero budget airlines made their way to the Lithuanian capital, but thankfully you can now reach Vilnius courtesy of Ryanair and Wizzair, whilst a number of traditional carriers also touch down here. Many travelers, on a grand tour of the Baltics, arrive via Eurolines (or their evil Russian cousin Ecolines) from either Warsaw or Riga depending which direction they’re headed, whilst its worth Googling around for other coach and bus options too. There has been talk of a high speed train (140 km+) that will eventually connect the Baltics with Warsaw but the crisis has set back the project. City Spy website has an interactive Vilnius map with extensive guide and recommendations. Print the map before you go. Vilnius Life is a great online portal for all things Vilnius with a strong focus on nightlife options and reviews. The Vilnius Official Site is an increasingly great resource with all the general what, where, when and hows and some inspirational ideas as well. 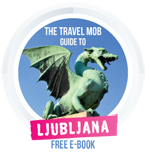 Few people know that the reliable city guides In Your Pocket.com actually started off in Vilnius. The bi-monthly print guide stays up to date about all the new openings and candidly shares their sometimes condemning and always irreverent reviews. Lending credibility to our assertion that Vilnius is one of Europe’s most romantic cities the film 2 Nights Til Morning chronicles the brief love affair of a French architect and Finnish DJ, when they get stuck in the Lithuanian capital due to the timely appearance of a volcanic ash cloud. Meanwhile scenes of the lavish BBC adaption of Tolstoy’s War and Peace were shot in St. Nikolai’s church, Lukiskiu Monastery and Gediminas Castle as well as several other locations around the city. 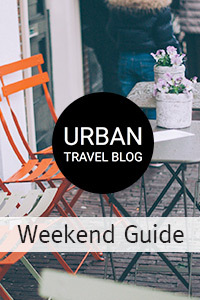 Vilnius is considered by Urban Travel Blog as one of the best affordable city breaks in Europe! Read up on all our selections here. I agree with author. Vilnius is full of beautiful places to visit! Thanks for the tips! I’m headed in May and am really looking forward to it! Hey Karisa, how did you get on in Vilnius in the end? Good times??? Thymn Chase is an American writer, journalist and musician living in Krakow, Poland. He has contributed as a writer and editor for magazines such as Lost in Krakow, B East, and the Krakow Post among others and is the Central & Eastern Europe Editor of City Spy Map.